85/92 David Mumpower Little more than a kitty snuff film. 124/126 Kim Hollis Vile film that shows all sorts of horrifying mistreatments of tigers. HATE. “Never work with animals or children.” That’s one of those sayings you always hear around Hollywood. Apparently director Jean-Jacques Annaud has never heard of this saying and we should be glad. Especially since Annaud’s first animal movie, The Bear, made more that $130 million worldwide, I don’t think he has to worry much about making a bad movie. Errrrrr, except for Seven Years in Tibet. Ok, and BOP's favorite cinematic whipping boy, the much reviled Enemy at the Gates. So let's just say his last animal movie was great and leave it at that. This time, Annaud tells the tale of tigers instead of bears. We follow the lives of two young tigers as they come of age in 1920s French Indochina (Cambodia). They are separated as cubs and taken away from their natural habitat. The bolder brother is taken captive by a circus, where his lonely, captive environment breaks his spirit. The gentler, shy tiger cub spends time as a pet of the governor's young son until an dramatic incident forces the family to give him away (the cub, not the son). The subsequent owner is the type of guy who would make PETA's Most Wanted List and he sets out to train the tiger to be a vicious fighter for sport. 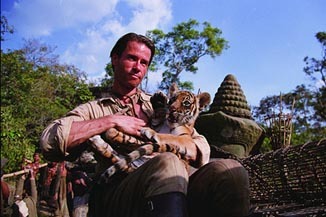 Many years later, the two tiger brothers are reunited by an animal captor played by Guy Pearce (it's unclear whether this is the same character who originally trained the shy cub to fight), who sets them up to battle each other. One thing to keep in mind, even with the advances in CGI technology, Annaud has chosen to use real untrained tigers in this film. When he directed The Bear he told Variety that he relates “to my animal star the way I would to my human star”. I’m sure he has taken this same approach with the tigers on this film. The movie was shot on various exotic locales such as Cambodia, Thailand, and France (can you consider France “exotic”?). Filming began at the end of October 2002 and surprisingly only took four months. The original plan was for a six-month shoot, but I guess the tigers were cooperative.